Did you know that Ecology routinely performs site checks to verify that operators have their CESF certifications cards? Take the Dungeness Environmental Chitosan-Enhanced Sand Filtration (CESF) training course and become an Ecology Approved certified CESF operator in one week. Taught by erosion and sediment control professionals who developed CESF technology over the last 10 years - you are sure to get the most accurate, practical and up-to-date training available. Our certified trainers have designed, built, installed, operated and optimized dozens of treatment systems across the U.S. 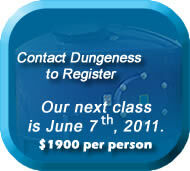 The class consists of all of the elements required by Ecology to become officially certified. It is comprised of both classroom and field sections. In the classroom you will receive 8-hours of training in a traditional classroom setting as well as hands-on training in our research laboratory. The 32-hour field training portion is taught by senior CESF technicians and takes place at a location convenient to those taking the course. If individuals are training to become certified for operations at a specific construction site, this may take place on-site. Fundamental knowledge of stormwater quality testing procedures and methods for parameters applicable for the region/local. Fundamental knowledge of water pumping and piping systems. Fundamental knowledge of stormwater discharge regulations and permits for applicable region/local.